Originally posted April 1. Reposted for the actual anniversary. Oh, the Fleming books remain in print. Ian Fleming Publication hires a continuation novel author now and then (William Boyd, the latest continuation author, is scheduled to disclose his novel’s title on April 15). Periodically, there’s a new book about some aspect about the film series. UPDATE: Other 007 blogs and bloggers are noting the anniversary today, including THE JAMES BOND DOSSIER, BOND BLOG, MARK O’CONNELL, JAMES BOND BRASIL, FROM SWEDEN WITH LOVE and THE BOOK BOND You can also read an article in the Express newspaper by CLICKING HERE. Finally, Spy Vibe, part of the COBRAS group of blogs, has a post including a graphic of various Casino Royale covers. You can check it out by CLICKING HERE. Yet another chapter in the saga of Casino Royale‘s journey from the page to the screen has been uncovered. 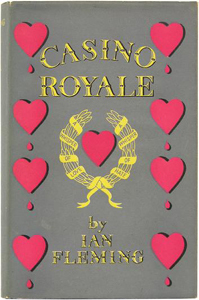 From 1954’s TV adaptation to 1967’s comedy aberration to 2006’s triumphal Eon series entry, Ian Fleming’s first James Bond novel has been kicking around Hollywood from almost the time of its initial publication. (HMSS’s Bill Koenig has previously written about Howard Hawks having considered filming it.) Now, Jeremy Duns reports in today’s The Telegraph that no less than Ben Hecht, “the Shakespeare of Hollywood,” had taken several swings at adapting the problematic novel for the big screen. In 1954, producer and director Gregory Ratoff bought a six-month option, and the next year purchased outright, the film rights to 007’s first adventure. In 1956, it was announced that 20th Century Fox would release Ratoff’s production, scripted by a “noted scenarist.” Ratoff’s death in 1960 eventually led to the CR screen rights going to Charles Feldman, who eventually turned to Ben Hecht to write a screenplay. Hecht is best known to film fans as the writer of Alfred Hitchcock’s Spellbound and Notorious, and Howard Hawks’ The Front Page and Scarface. Hecht would eventually write four scripts of varying faithfulness to the Fleming novel — a couple of which seemed to be attempts to shoehorn the film into the Broccoli & Saltzman Eon James Bond series! Duns’ story, Casino Royale: discovering the lost script, is a must-read for James Bond fans, movie fans, and students of the history of cinema. You’ll be amazed and intrigued (and perhaps a little regretful that it never came to pass).